When I first saw Travis Huggett's work I sensed something iconic, something classic, but I could not put my finger on exactly what it was about his photographs that was making me feel this way. Later, it would come to me - it's the stillness, the calmness, in the photographs of situations we New Yorkers (part-timers included) know to be anything but calm and still. Henri Cartier-Bresson spoke of a "decisive moment" and, surely if HCB were alive today, he would agree with me in saying that Travis Huggett has taken that concept to heart. 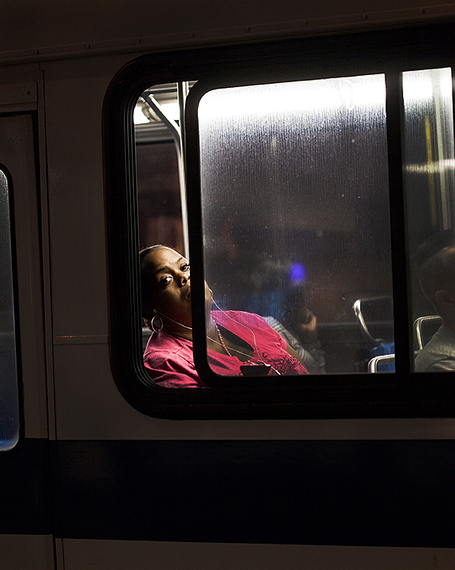 The images here are most certainly decisive - they capture that exact second which typifies a New York City bus commute and they do it time and again. Michael Ernest Sweet: Travis, this is great work. I have to say that right up front. Every so often I see a photographer's work and I think to myself, "I wish I'd done that!". This is one of those times. This is great material for a book; this IS book photography at it's finest. Any plans to produce this project as a book? Travis Huggett: Thanks so much! That is always nice to hear. My goal has always been to turn this project into a book and show. I've spoken with some publishers, but I've been waiting until I feel like the shooting portion is done before I really start figuring out what comes next. MES: How did you come up with this idea? Were you sitting at a stop waiting for a bus (laughing)? TH: Pretty close. 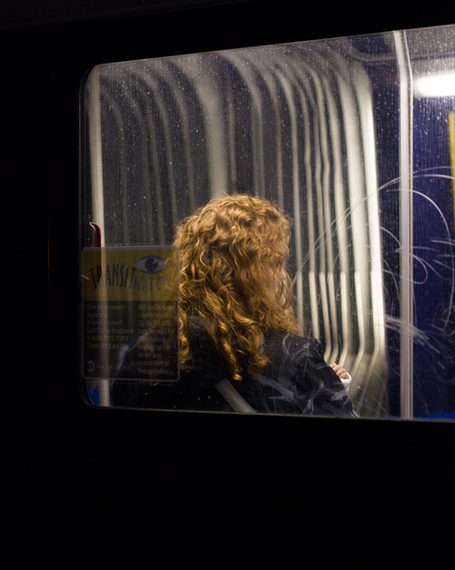 I'd noticed how exposed and interesting the bus riders looked at night, but it wasn't until I saw a girl peeking out of a streak in a fogged up window one rainy night that I saw the potential. I tried to photograph her with my phone, but I missed it. After that I started going out in the evenings with a camera. MES: What equipment are you using for this series? TH: I'm shooting it entirely with a Canon 5d Mll and a 100 mm lens. MES: This work really makes the 5D MII shine. I guess, given the low light, you really needed a good sensor. Do you always use big cameras (read: DSLRs) or do you also use rangefinders or even film cameras? Tell us more about your gear. TH: For my commercial work I rarely use anything other than the few Canons I own. I have a good selection of lenses, and I feel really comfortable and confident with them. Sometimes I'll rent a Hasselblad H2. For my personal work I mix it up more. I shoot film with a Mamiya 7 that I love and of course I shoot a ton with my phone. MES: I do a lot of my street photography in New York City. I know that it's quite easy in terms of shooting strangers, that is, most New Yorkers don't care what you're photographing. At least this is true in comparison to the French (I also live in Montreal) or the Germans, for example. In this series, were the subjects even aware of being photographed? Did you ever engage with anyone? Perhaps someone jumped off the bus and inquired? TH: I've been surprised by how little most people seem to care that I'm photographing them. I think the fact that I'm often shooting them on their way home at the end of a long day makes a difference. They are just too tired to care much. I get some dirty looks, some smiles, but not much beyond that. I've always half expected someone to hop off and ask what I'm doing (or worse). I do have a good series of a young girl noticing me and taking out her phone to get a few photos of me before the bus pulled away. She is laughing in the last frame, and I can only assume I'm laughing in hers. 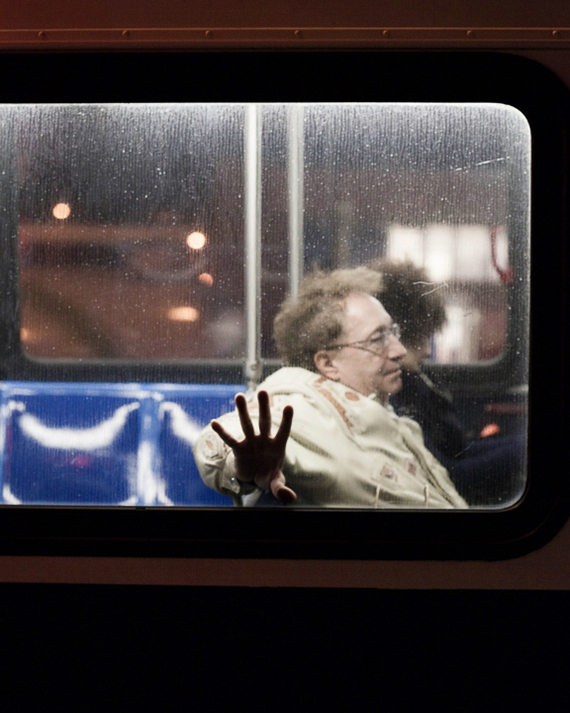 MES: Yes, I think often New Yorkers are just too tired, period, to care much about it. That's good for us, I suppose. In this series you are shooting in both color and black and white. Do you always alternate, or is there one that you particularly enjoy over the other? TH: I don't always alternate, but I do often really like when a series uses both. I find it liberating. 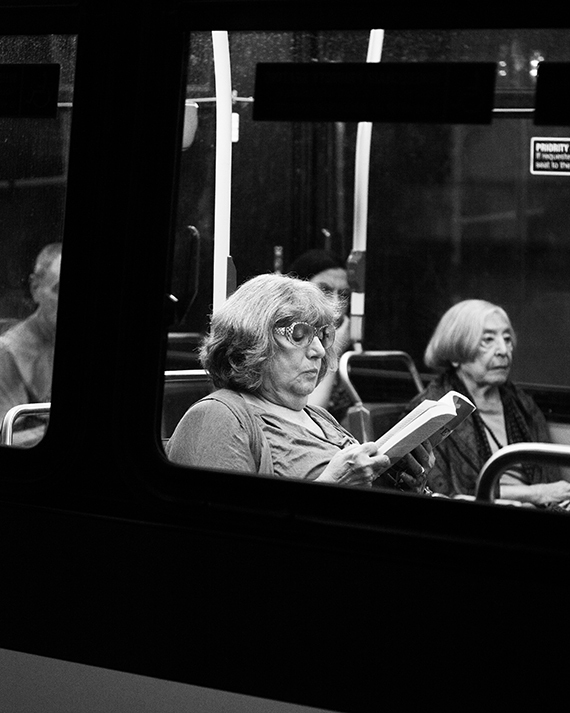 Of course with digital, I get to decide after I shoot, so pretty early on I started making some B/W. If I feel the color isn't serving the photo, I'll switch it. Often times there are so many colors being reflected in the windows, that I'll switch just to help bring the focus back to the subject. I typically prefer color though. MES: I agree, I like the monochrome images, but there is something very enchanting about the color in this series. What kind of a timeline are we seeing here in these images? Was this all shot in an evening, or over a month - a year? TH: I started shooting about 10 months ago. MES: Why not do this during the day also? 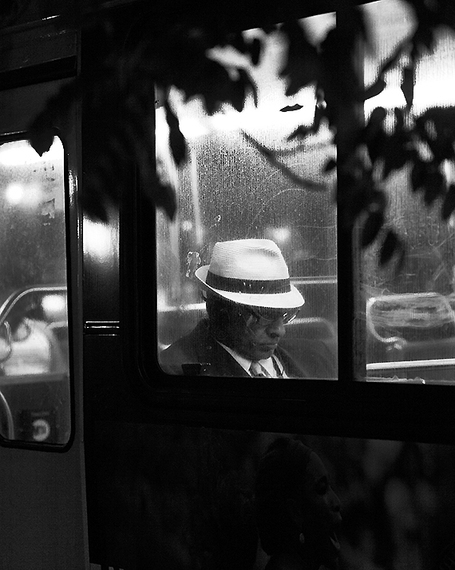 Is there something about the atmosphere of the night that you find lends itself well to this series? 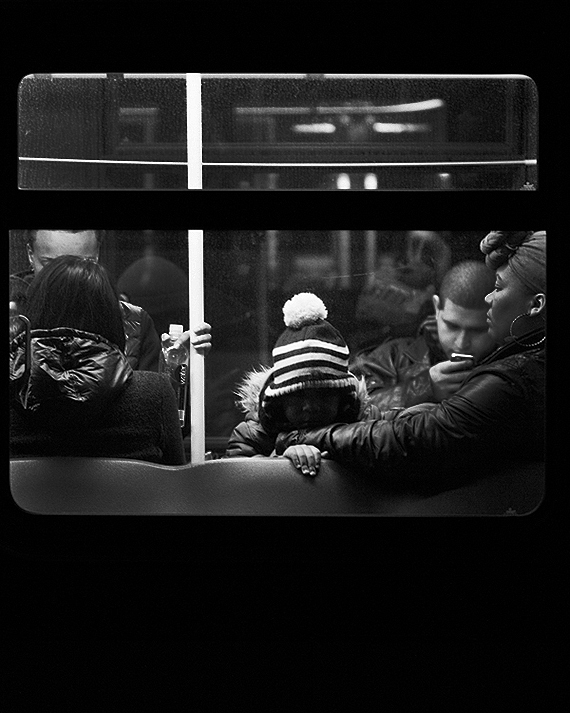 TH: I do love the atmosphere at night, the dark streets contrasting with the bright lights of the bus interiors. Honestly though, if I shot during the day it would just be a series of my reflection in the windows. You just can't really see inside the buses very well during the day. MES: Switching gears a little, tell us about some of the photographers you admire (both contemporaries and masters). TH: There are so many, and I love so many different styles of photography. As far as street photography, Fred Herzog, Saul Leiter, Bruce Davidson (later I'll be mad about who I left off this list). I'd consider those guys my favorites of the "masters". I also love Mary Ellen Mark, Peter Lindbergh, Stephen Shore, Mitch Epstein, Rineke Dijkstra. Dan Winters is great, Todd Hido, Khalik Allah is amazing, Arne Svenson, Mike Brodie, Peter Bialobrzeski. MES: I'm currently working with Arne on an upcoming feature. Stay tuned. I see you have a BFA in photography. How has this helped you in actually producing art? I know a lot of people out there today (photographers, writers etc.) are debating the whole BFA/MFA to do or not to do thing? How do you feel about this? TH: I think it has helped me, in that being at an art school, studying photo and making art, talking about art, etc, it puts you in the frame of mind that art is important. It has great value. It NEEDS to be produced. Outside of that environment, I think it's marginalized. So just being there instilled in me this feeling that I should always be making art, and as a result part of my personal fulfillment requires it. Now, did it help me become a professional photographer, earning a living doing photography? Not really. I learned most of those tools by assisting great photographers after I graduated. I guess what would be best would be a school that gave you a good dose of both, but sometimes those two worlds don't coexist very well. MES: Getting back to the photographs for a minute, one of the things I like most about these images is the emotion. 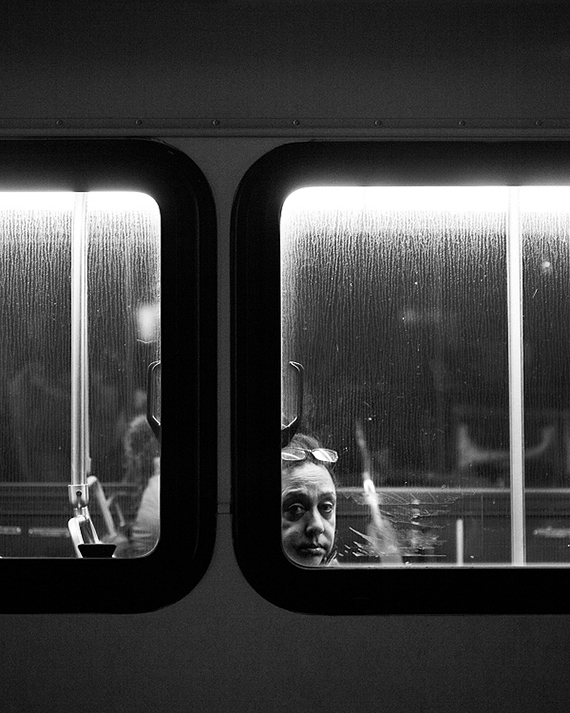 In nearly every photograph there is some particular human emotion that almost literally speaks to the viewer. The woman in pink who's on to you and your camera; the young girl and perhaps her mother - the mother staring into space, the young girl inquisitively looking toward your lens; the man with his hand against the glass, perhaps fatigued with a long commute; and the woman in the back seat looking down, perhaps reading, in almost a meditative state. These photographs are all struggling to speak, to express these vivid emotions of frustration, curiosity, stillness, anxiety etc. Was it easy to find these subjects or did you have long periods of waiting? If one simply looks at your work, it would seem as though a NYC bus is a photo set on wheels - the ideal place to capture candids. TH: It is a great place for candids. Of course there is a lot of waiting around. Some nights I'll shoot for hours and really get nothing. Sometimes it just doesn't work. Buses will pass with no riders, or with people only in the seats I can't really shoot well. It happens all the time. Other nights, it feels easy, like I've given the riders instructions. Everybody get in the seats with the good light! Put down your phones! Look this way! MES: Some people feel that the location of a photograph determines it's invasiveness. This may be true in some circumstances, but I'm more inclined to believe that it is the 'moment' that is more likely to be intrusive. For example, in these images you have caught person after person in very private inner thoughts - it shows. The subjects were mostly likely not at all aware of you most of the time. These people were inside themselves and you photographed them. Does this concern you in any way? 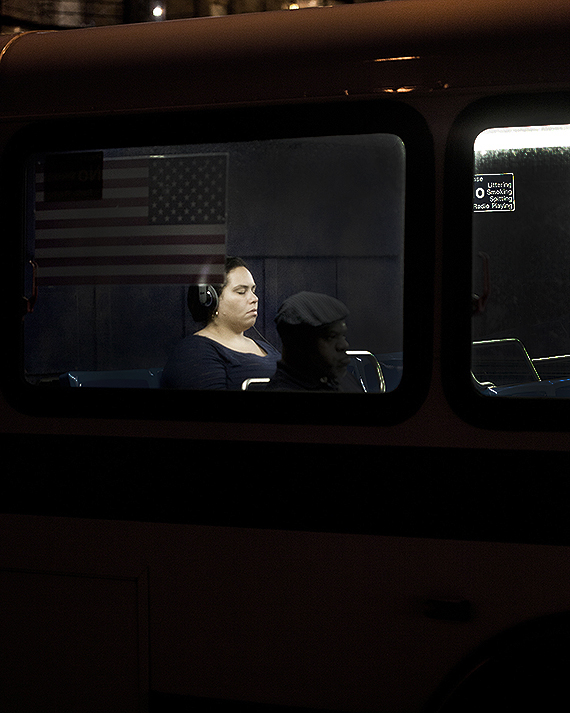 I think of Arne Svenson's work, for example, where he photographed through people's windows to capture similar moments. Is there a question here? I'm not entirely sure. I guess I'm trying to get your opinion on whether the 'street photographer' should be respectful of photographing in physical locations, or whether we should be cognizant of the subject's 'head space'? Can we intrude on one's mental space as well as their physical space? TH: I think about this all the time, and honestly I can come down on either side of the argument on any given day. I suppose this means I fall somewhere in the middle. I love Svenson's work. I thought that show was beautiful, but if it had been my window he was shooting through, how would I feel about that? Not great maybe (though he seemed conscious that showing people's faces was somehow crossing a line). So, how would I feel if after a 10 hour shift I looked out the bus window to see some guy "making his art" by taking pictures of me half asleep? I don't think I'd be thrilled. Not that I think it's the same by any means. 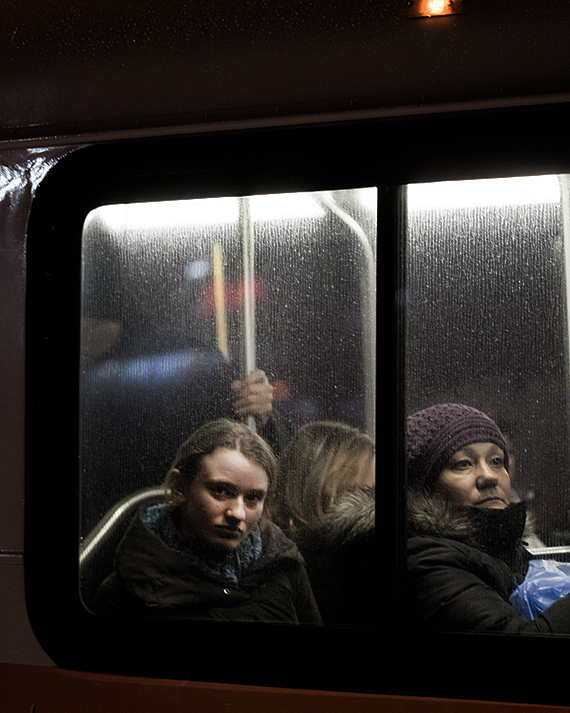 The bus is clearly a public space and that changes expectations of privacy a great deal. In NYC it's safe to assume that you are being photographed by video cameras at almost all times. That doesn't mean I wouldn't understand if someone was bothered by me taking their photo. I try to be respectful, if I feel like someone does not want me taking shooting them, I'll move on. I don't know. It's a difficult question. I hope that I'm being respectful of people's head space and actual physical space, but I suspect some of my subjects would disagree. MES: Okay, an easier question this time. What are some of the other projects you're currently working on? TH: I'm working on a portrait series about influential people. It started with a portrait of Merle Haggard, and has moved on from there. 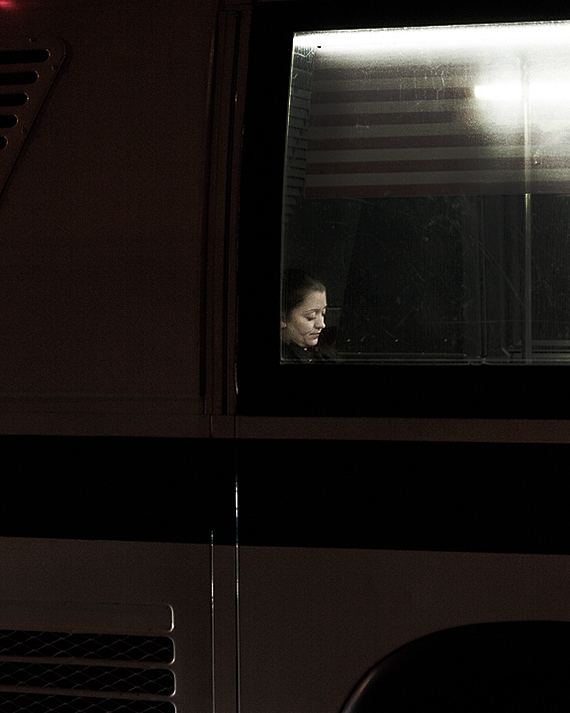 Unlike this bus series, it involves a lot more people and scheduling, so that is moving very slowly. Also, in the fall a book I shot with Dave Arnold of Momofuku's Booker and Dax Bar will come out from WW Norton and Co.
MES: WW Norton and Co. That's big stuff, Travis. Congratulations. Again, this is great work. I'd love to see it as a coffee table book. Next time you're in the Norton offices you can go ahead and quote me. First copy sold! Until then, best of luck with this project and thank you kindly for sharing with us here. TH: Thanks so so much, Michael. I'll tell Norton that I can personally guarantee them we will sell at least one copy, probably two, because I think my grandmother will buy one also. I've been writing this blog for HuffPost for a little while now, and I have to say that it is giving me immense pleasure to help discover and promote emerging photographic talent. There is a distinct joy in finding great work like this and sending it out into the world to be seen by others. I love being behind the camera too, don't get me wrong. But, I feel the "photographic community" is waning in some ways - everyone merely busy pushing their own work - and this is a refreshing break away from that dog eat dog world. There is a creativity to be found in discovering the work of others. This blog also provides me with an opportunity to write, another passion of mine. However, if it is to work on need to be able to count on you - the readers - to read, share, like, tweet and, most generally, promote the posts. If not, it all falls flat. So far there has been keen interest and support and for that I thank you, the readers, from the bottom of my heart. 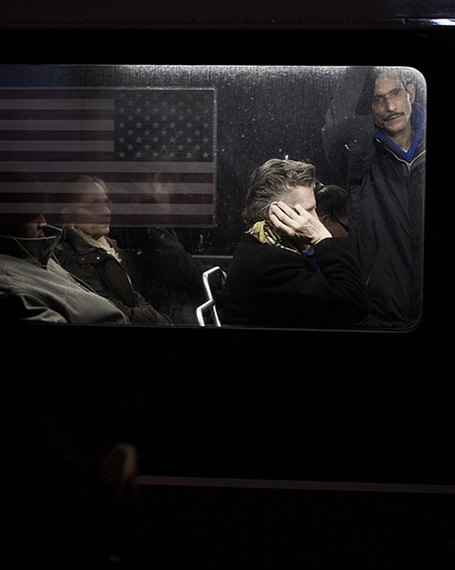 Travis Huggett is a New York City-based photographer who grew up in Rhode Island. He earned a BFA in photography from The Pratt Institute in Brooklyn. Working primarily in portraiture, advertising and fashion, his photos have been exhibited in New York City, Boston and Connecticut. His work has been seen in Vanity Fair, as album covers for Vanguard Records, and on his mother's mantelpiece. He lives on the Lower East Side with his wife, Ridgeway, and their son, Orson. Follow Travis on Instagram, Tumblr, or Twitter. Want to see your photography featured here? Follow me on Twitter to hear of specific submission calls or, simply tweet me your best stuff @28mmphotos.